The term “lower blepharoplasty” includes a collection of surgical techniques that aims to improve the appearance of the lower eyelids. Historically, lower blepharoplasty was a reductive procedure in which skin and/or fat was removed in order to reduce lower eyelid wrinkles, skin redundancy, and fat bulges. 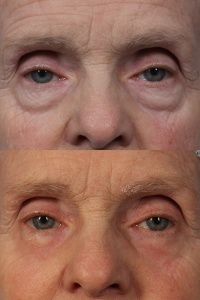 While fat and skin excision is still performed with modern lower blepharoplasty , present trends follow a tissue-preserving philosophy that may include orbital and sub-orbicularis fat repositioning and fat transfer techniques to restore apparent volume loss associated with facial aging. In the early 2000’s, hyaluronic acid-based dermal fillers emerged as an off-label means of lower eyelid and infra-orbital volumization. Laser energy and light-based treatments have also been applied to the lower eyelids, providing non-surgical lower blepharoplasty options or non-surgical adjuncts to incisional blepharoplasty. Visual acuity, pupillary exam, extraocular motility. Standard view external photographs are obtained prior to surgery. An effective surgical rejuvenation of the lower eyelids addresses the patient’s concerns that correspond with anatomic issues identified in examination. Appropriate techniques and nuances can vary amongst surgeons. A single procedure or a combination approach may achieve the desired endpoint (e.g. transconjunctival fat manipulation with anterior skin pinch). Markings are often performed with the patient in a seated position. The borders of steatoblepharon and hollowing are drawn with a surgical pen. Local anesthetic consisting of lidocaine and/or bupivacaine with epinephrine is infiltrated at the operative site. Topical anesthetic drops are instilled in the inferior cul-de-sac. A corneal shield may be placed. A sterile preparation is used. A desmarres retractor provides exposure and an infratarsal incision is created through conjunctiva and lower eyelid retractors. Ballotement of the globe assists in visualizing the fat pads and determining the proper incision location. Traction sutures placed in the proximal conjunctival edge aid in exposure. If exposure is inadequate, lateral canthotomy and inferior cantholysis may be required. Direct access is gained to the three lower eyelid fat pads without disruption of the orbital septum. The orbital fat pads are debulked or mobilized as pedicles for repositioning to areas of concavity inferior to the orbital rim. Strict hemostasis is maintained with monopolar or bipolar cautery. The inferior oblique muscle is visualized and left undisturbed. Fat redraping can occur in the suborbicularis or subperiosteal plane after creating a pocket and releasing attachments. The fat pedicles are secured with percutaneous sutures or internal absorbable sutures. The suborbicularis oculi fat (SOOF) may be elevated and secured to the orbital rim periosteum with absorbable sutures via the transconjunctival incision. Similar to orbital fat repositioning, a SOOF lift aids in effacing the tear trough and infraorbital hollows. The conjunctival incision may be approximated with absorbable sutures or may heal without direct closure. An incision is created 1-2 mm inferior to the eyelash line or within a preexisting infraciliary crease, extending to a lateral eyelid crease. A skin “pinch” may be used to determine the amount of redundancy by crushing the skin with a hemostat without causing traction on the eyelid margin. Alternatively, a skin flap may be created, extending as far as necessary to adequate mobilization without distortion of the shape of the eyelid aperture. A conservative amount of skin is removed to avoid anterior lamellar shortage. The patient is asked to gaze upward and open their mouth to assess the allowable amount of skin trim. The skin-muscle approach initiates a flap deep to the orbicularis and allows for superior advancement and trimming of skin and muscle individually or as a single unit. Access to the orbital fat pads and SOOF is possible from the infraciliary incision and is managed in the same way as the transconjunctival route. An infraciliary incison, either complete or lateral provides access to the orbicularis muscle and the orbitomalar ligament which can be elevated and suspended to the external lateral orbital rim periosteum in order to lift and support the eyelid. Lateral canthopexy can also be performed using the same incision and is often performed with infraciliary blepharoplasty to maintain or elevate the position of the lower eyelid. The skin incision is closed with fine monofilament or absorbable catgut sutures. Significant lower lid laxity documented prior to blepharoplasty is managed with canthopexy or lateral canthoplasty. Fat grafting techniques may be used to add volume to the infraorbital hollows and the lid-cheek junction. Alloplastic orbital rim and malar implants can also improve volume and projection deficiencies. Laser skin ablative or non ablative resurfacing or chemical peels improve the lower eyelid skin quality and reduce rhytidosis and dyschromia in appropriate candidates. Ligation, sclerotherapy, or laser treatment can reduce or eliminate the appearance of unwanted prominent lower eyelid veins. Botulinum toxin injections minimize the dynamic creases that form in the periorbital region and lower lids. Lower eyelid retraction is a potential risk of lower blepharoplasty and may be more common when the septum is violated from the anterior approach as compared to the transconjunctival approach. Retraction is observed as a low-positioned eyelid that is tethered to the orbital rim due to scarring of the middle and/or posterior eyelid lamellae. Anterior lamellar shortage may also occur and is caused by overzealous skin removal, unfavorable contraction after surgery, or poor healing after eyelid skin resurfacing. Ectropion, independent of retraction or skin shortage can take place after lower blepharoplasty if a lax lower eyelid is left uncorrected or if postoperative tractional forces are unopposed in the setting of poor canthal support. American Academy of Ophthalmology. Oculoplastics/Orbit: Lower eyelid blepharoplasty Practicing Ophthalmologists Learning System, 2017 - 2019 San Francisco: American Academy of Ophthalmology, 2017. This page was last modified on October 2, 2018, at 10:46.